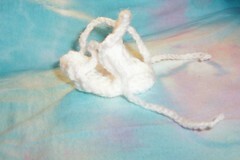 easy-on preemie bootees « T-Bird\’s crafty Blog! « A not so surprising jacket! These bootees are made to open pretty much all the way out making them easy to place onto tiny feet and lace up. Instructions are for very tiny feet, add in more chains for a longer foot size and an extra round for full term baby feet which are much chubbier. Chain 8, work htrs into 3rd st from hook and each stitch to end of chain, work 4 htrs into last st and return up the other side of the chain working 3 sts into base of climbing chain and a ss to close. Chain up 2. Work to the 4 htrs at the end of the chain. Work each of these 4 sts twice, continue round to other increase, work each of the 3 stitches twice then once into the ss used to close the last round, ss to close round. Ss next st, chain up 2 and turn. Work round 8 sts, ch 2 and ss into next st. finish off. Work first 2 rounds of base pattern then finish. Hold top and base together and using contrast yarn. Start 1 st before the beginning of the curve at the toe end work round, catching the loops of both base and top peices, in doubles until 1 st after the curve on the other side of the toe. Continue in doubles but just on the base part, work up the side of the ankle shaping. Chain 3 and work along the top of hte ankle in trebles, chain 3 after last st and work down teh side of the ankle and back to the beginning of the join in doubles. Ss to close then turn to work along the toungue (part of the top you have not secured) until the top 4 sts of the shaping. 1st st work 1 dc, 1 ch, 1 htr, 1ch. 2nd and 3rd sts, (1tr, 1 ch, 1tr, 1ch) in each, 4th st, as 1st, continue back down other side of toungue and finish. Chain for 13″, thread through the gap between the dc and htr at the top of the toungue, round the trebles at the ankle and back out through the gap on the other side of the toungue. 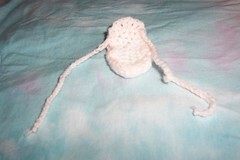 The very long lace and the design allow the nurse to open the bootee pretty much all the way out so it can be placed on the baby’s foot then fastened on without struggling with tiny toes being caught or stiff feet not going the way you want them to. Pretty ribbon would look much nicer but I didn’t have any. This entry was written by tbird and posted on 2 September , 2006 at 8:50 pm and filed under SCBU items. Bookmark the permalink. Follow any comments here with the RSS feed for this post. Post a comment or leave a trackback: Trackback URL.